H20 is the most important molecule on earth. Our bodies are almost 75 percent water, and most animals do not survive very long without it. Unfortunately, clean potable water is becoming increasingly more difficult to come by. Additionally, it takes an increasing amount of energy and resources to maintain our drinking supply. We have to make simple changes to secure our most precious resource — water — for the future. Conserving water is not as glamorous as conserving energy, as there is no immediate payback. While it may seem to some that there is an unlimited supply of water, this is simply not the case. There are water shortages across the country and the world. In the Gainesville and Ocala, FL, where our water is obtained from the Florida Aquifer, we are lowering the water table and experiencing salt-water intrusion. Building desalination plants — facilities that remove salt to produce potable water — are expensive and consume massive quantities of energy, usually obtained from coal or oil. What Are The Benefits Of Conserving Water? Conserving water can help to secure the availability of this precious resource for the immediate and distant future. The simplest method of securing our water resources is by making simple changes in terms of the manner and quantity of water usage as well as our lifestyle. The environment provides us with enough water for all our needs; we must make an effort to not be wasteful. We can also save some money by doing so. The average household spends as much as $500 per year on its water and sewer bill, but could save approximately $170 per year by retrofitting with water-efficient fixtures and incorporating water-saving practices. Sunshine Plumbing and Gas is the leader in the Water Conservation and Reclamation movement in North Central Florida. Whether its rainwater reclamation, greywater systems, water-efficient faucet fixtures, residential plumbing audits, or commercial plumbing audits services, our plumbing repair company has you covered. We can work with our designs — or your own — to help you sustainably secure adequate water for the future and lower your overall consumption of water. Contact us to improve your home or business’ sustainability. Install High-Efficiency Toilets (HET's) or Dual Flush Toilets. Recent advancements have allowed toilets to use 20 percent less water than the current federal standard, while still providing equal or superior performance. You can save 4,000 gallons per year with this simpler, greener choice. We provide a full scope of toilet replacements and installations to residential and commercial properties. Contact us today. Install a rainwater collection system to use for landscape irrigation or mechanical system operation. This can increase your property value and for commercial structures, lower the size of your required retention pond. One inch of rainfall produces 0.62 gallons of water for every square foot of roof space. For a 3,000 sq.-ft. house, that could mean 1,860 gallons of free water for every inch of rainwater. Rainwater collection or harvesting systems can range in size to simple barrels at each corner of the house to 500-gallon tanks; 1,000-gallon tanks; and larger gallon tanks with submersible pumps placed underground on your property. 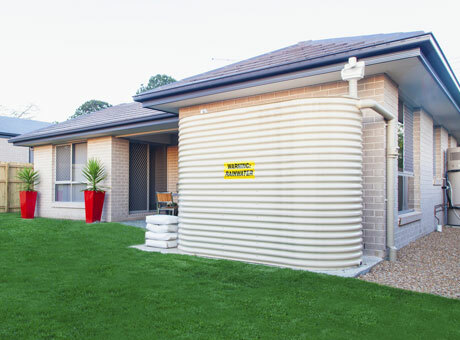 Call us to discuss designing your residential and commercial custom rainwater collection system. Promote the Environmental Protection Agency (EPA) WaterSense program. Look for the WaterSense label on appliances to ensure you choose quality, water-efficient products. Repair all plumbing and water leaks. A leaky toilet can waste 200 gallons per day! To detect leaks in the toilet, add food coloring to the tank water. If the colored water appears in the bowl, the toilet is leaking. Consider purchasing a high-efficiency washing machine, which can save over 50% in laundry water and energy use. Call us to deliver and professionally install the new appliance. The expert installation will ensure optimal function and sustainability. Promote the Florida WaterStar Program program, which offers resources and incentives to builders and homebuyers who value water efficiency in new home construction by choosing sustainable appliances and features. Irrigate more responsibly. Install simple and cheap rain gauges, install micro-jet or drip irrigation that focuses directly on the plant and reduces waste and run-off. Contact us to help you switch your current irrigation to drip or micro-jet. Repair dripping faucets and showerheads. A drip rate of one drip per second can waste more than 3,000 gallons per year. Schedule faucet repair services to improve your home or business’ water-savings and promote water conservation.